When this is published I’ll be in London attending a life drawing course. I’ve written before about the tuition in drawing I’ve received, and about the courses offered by Rachel Clark. This will be the first of her courses I’ve attended since around 2008, so it’s been a long break. It’s not so much that the courses themselves are expensive, but once you’ve added in the cost of travelling there, and staying in London, it all becomes rather costly. However, I decided that it was high time that I did another of Rachel’s courses and I’ve been very much looking forward to it. I booked and paid for it several months ago and I’ve been worried that the experience would be spoiled by my on-going problem of jaw pain. However, although that hasn’t gone, it has diminished and on quite a lot of days the pain is at a relatively low level. So I think I should be able to enjoy the experience fully. The course runs over Saturday and Sunday, then on Monday morning I’m going to the John Singer Sargent exhibition at the National Portrait Gallery – I wrote about this a few posts ago. I’ll report back via a blog post sometime during next week. As if Sonia Delaunay and John Singer Sargent exhibitions weren’t enough, along comes another treat – the Richard Diebenkorn exhibition at the Royal Academy. I can’t believe I didn’t know about this until just a few days ago, but anyway, I know now, and it’s on till June so I should be able to get to see it at least once. 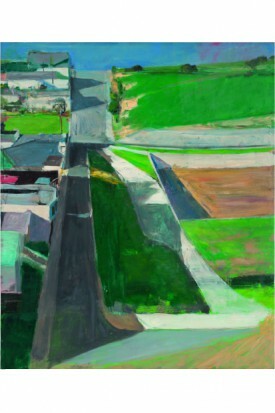 I read in a review that Diebenkorn is not particularly well known on this side of the Atlantic and maybe that’s true, but he’s one of my all-time favourite artists, and I’m thrilled to my marrow at the prospect of seeing his paintings again. The first time I became properly aware of Diebenkorn was about twenty years ago. I’d had the good fortune to get funding from my university to attend a conference in Hawaii, well in Maui, to be precise. This was a big deal as budgets would not normally stretch that far, and I’m still not quite sure how I talked my way into this megatrip. Spending nine days on Maui was quite an experience, the more so as I knew very well it was not a place I’d ever go at my own expense and so I’m completely sure that I will never go again. I can’t remember if I’ve mentioned it previously on this blog but I hate and fear flying, so a trip to Maui from Manchester was never going to be an easy ride. It was, essentially, a nightmare. The last straw was when I got on the plane in San Francisco for the final, five-hour, flight to Maui, and found a big bloke sitting in my seat. Turned out we’d both been given the same seat number. He was boorish, and unpleasant, and announced loudly that he had no intention of moving. I was near to tears at this point, but the flight attendant pitched up at just the right moment, took in the scene with one expert glance and told me that she was sure they had a spare seat in first class. And so they did. She whisked me off to first class and gave me a glass of champagne to calm me down. Which it did. I don’t think I’d mind flying nearly so much if I could have champagne and sit in a nice comfortable seat in first class every time…. Anyway, that is not the point of the story. The first leg of the trip back from Maui was the return flight to San Francisco which arrived at 6am. No first class, of course, this time. And then I had a whole day to spare in San Francisco because my flight to London wasn’t until the evening. I was already tired because I hadn’t slept on the flight, but I didn’t much relish the prospect of a day in the airport, so I jumped in a cab and headed for the city. I ate a huge cooked breakfast in a diner, then when it was opening time headed for the San Francisco Museum of Modern Art. And that was basically it for the day. I didn’t go anywhere else; just stayed there till it was time to go back to the airport. And it was fabulous. When I got really tired, I’d retire to the café and drink some more coffee, and talk to someone. I do like it about Americans that they tend to be so easy to talk to. It’s actually a bit like that in the North of England; people don’t think you’re mad if you strike up a conversation. But what about the art? Well, I struck lucky because there was an exhibition of Diebenkorn’s paintings. I’d seen examples of his work previously in books, but I couldn’t say I was familiar with it. But seeing the paintings was a quite exceptional experience. I say this, because I remember so well, even after the passage of many years, how those paintings made me feel. They really are special. And it felt appropriate to be seeing them in California where Diebenkorn did so much of his painting. This was one of my best ever days out at an art museum, although it was physically a very gruelling experience. I didn’t want to waste the opportunity so I went round and saw the lot; everything they had on show which included not only the Diebenkorn but also an Alexander Calder exhibition. I had so much time on my hands that I even did some drawings while I was in there. By the time I got back on the plane that evening I was about as tired as I’ve ever been, but it was worth it. The example I’ve included above is Cityscape #1, which is a semi-abstract piece. It’s an interesting title, because so much of the location is green space. An art teacher I had subsequently pointed out how clever the construction of this painting is. It’s intersected about 1/3 of the way from the top by a quite distinct line, and then the 1/3:2/3 split is also followed in the vertical plane. I often think about this painting when I’m puzzled over composition. It’s made more interesting by the use of shadows, and by the bright elements of almost neon colour – for example, the bright pink and turquoise to the extreme left. If I do get to this exhibition I’ll no doubt be burbling on about it in some future blog post. 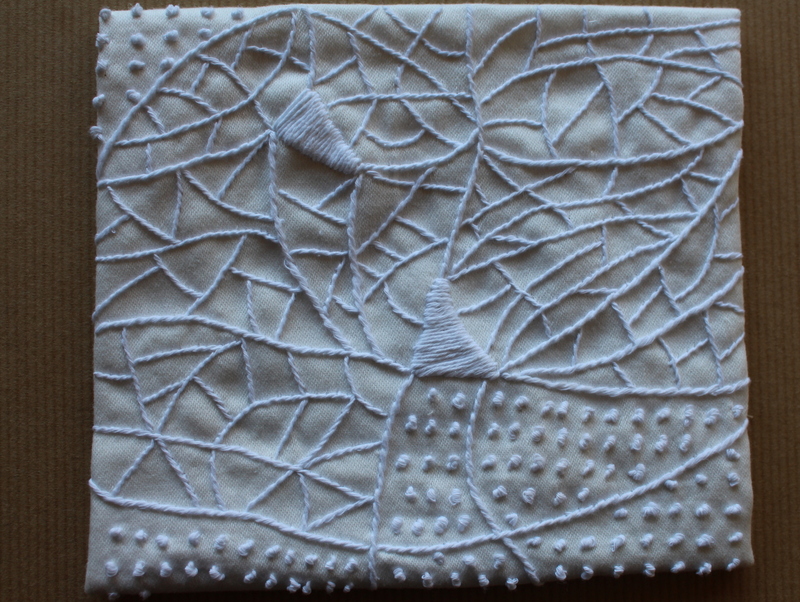 I haven’t made as much progress as I would have liked with my whitework sampler, so I decided to show you something different today. 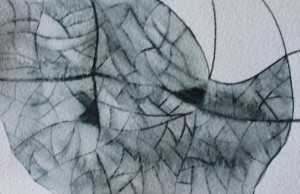 This is a sample in the ‘cuadro’ style which I produced for my C&G Diploma. There’s a requirement for the Diploma to study the embroidery of three countries, and to produce a sample in the appropriate style for each country study. I loved doing these, as indeed I loved most aspects of the Diploma. My countries were Afghanistan, Japan and Peru, and the ‘cuadro’ sample belongs to the last of these. ‘Cuadro’ means picture in Spanish. In a modern Peruvian context, this is the word used to describe a relatively new form of embroidery which has a political purpose. These pictures are also known as ‘arpilleras’. This style of embroidery appears to have started in Chile, as a form of political protest and solidarity under the aegis of the Catholic Church. It was a medium that women could use to express their anguish over their disappeared relatives. 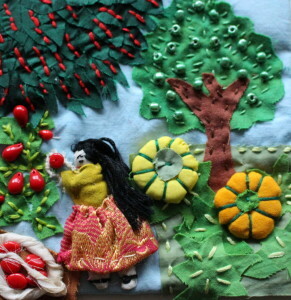 This style of embroidery uses patchwork and three-dimensional padding to show scenes of modern life, often with a political message. The testaments embodied in these cuadros became economically and politically useful because they could be used as consciousness-raising medium exported to rich and influential countries and also as a means of making money. Pictures in this style are produced in Peru in shantytown workshops surrounding the capital city, Lima. The pictures are exported by Catholic nuns as a means of providing a living for poor families. Although the messages conveyed by the cuadros are often overtly political it is also quite common for them to depict contented scenes of everyday life. I chose such a scene for my sample, and I loved doing it. I used tiny scraps of material that would otherwise perhaps have been thrown away and I spent some time and effort getting the composition right. I’m not sure I’ll ever produce another one, but when I see this sample, I remember how contented and absorbed I was in making it. You can read more about arpilleras in this essay by Marjorie Agosin. 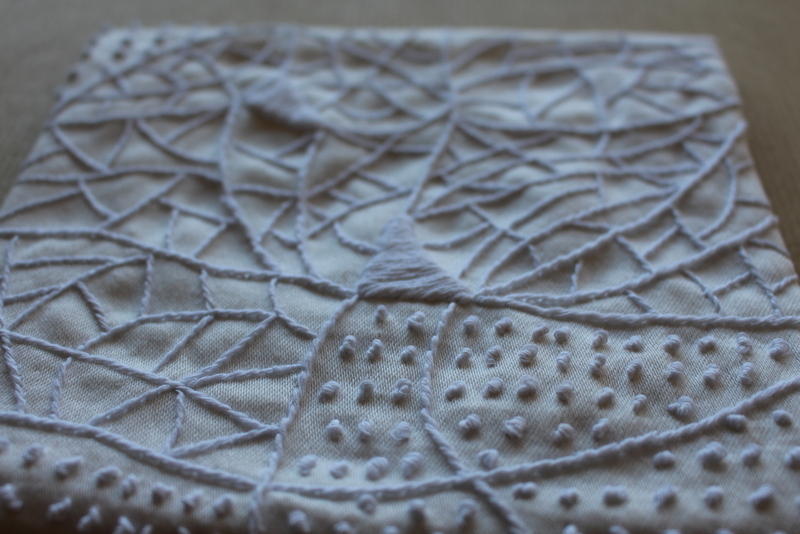 That’s the problem with whitework: keeping it clean. Since completing my first piece of Mountmellick work I’ve been much more careful to prevent the work getting grubby. As I said in the earlier post, Tracy A Franklin and Nicola Jarvis in their whitework book recommend using a pale blue pencil to draw the design lines. I’ve done this with the sampler piece I’m currently working on and it really does seem to be effective. You can see the lines, but they do fade gradually, without leaving a faint grubbiness. 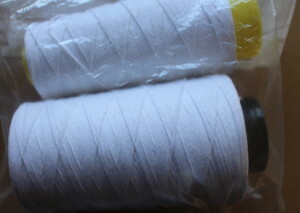 I am taking care to cut only short lengths of cotton. 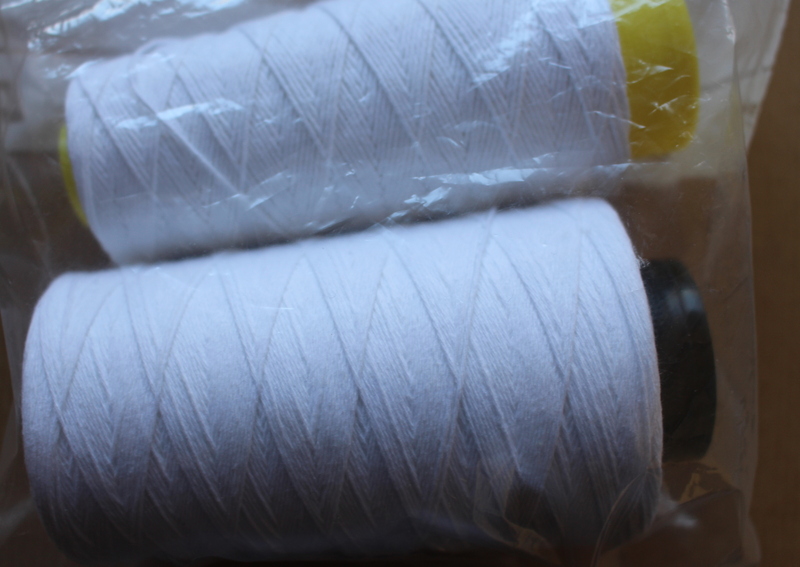 This means that I have to change the thread more often than perhaps I otherwise would, and that there’s more waste. This goes against my natural thriftiness with materials, but there’s no point cutting and using a long length only to find it turning grey towards the end. I’m washing my hands thoroughly before starting work, and I’m not applying any hand cream. This is a nuisance as I like hand cream (especially Burt’s Bees honey and almond) and I don’t like the feeling of my hands being dry. I’m keeping the work in a plastic bag at all times unless actually working on it. I’m trying to keep the cat well away from operations. This is difficult as she’s a most affectionate creature and loves being on a knee, but if I’m to keep my whitework white, she’s got to make some sacrifices. Anybody out there got any other useful tips? Do leave a comment if you have. I’ll be plugging away at the whitework and hope to report back on progress very soon. 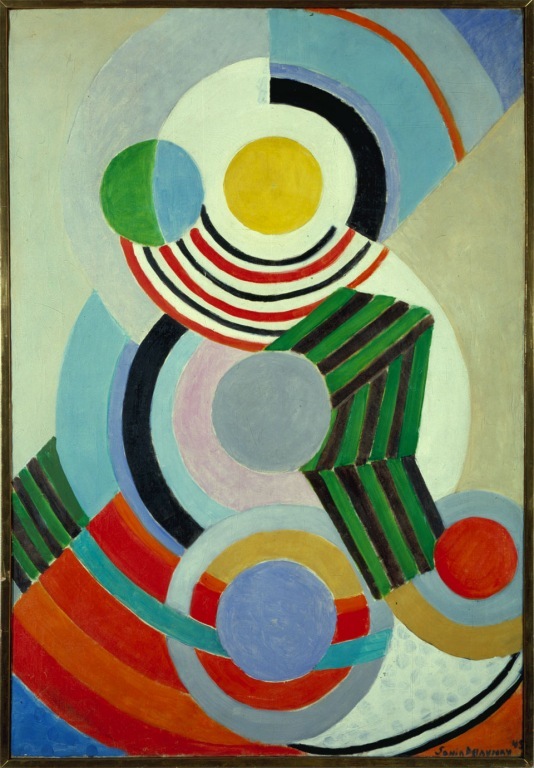 I’ve just found out that there’s an exhibition of Sonia Delaunay’s work at Tate Modern this year. It’s running from 5th April to 9th August, which is not a very wide window of opportunity for those of us who live outside London, but I expect I’ll find an opportunity of getting down there at some point within the four months. I will relish the chance to have a good look at some of her work, because I think I’ve only ever seen it in reproduction until now. I love her bold geometric patterns and use of colour, and there’s nothing like seeing pictures for real. I will be down in London later this month. Although I’m going to be very busy, I hope to make the time to see the John Singer Sargent exhibition at the National Portrait Gallery. There are over 70 of his portraits in the show, and I’m sure it will be well worth seeing. When I think of all the wonderful exhibitions that are on in London I could kick my youthful self. I spent five years in London when I was in my 20s and despite professing a vague interest in art, I hardly ever went to galleries. But now that it’s really expensive and inconvenient to get down there, I really want to go. I suppose that’s life for you… and people who live in large cities often say that they don’t take advantage of what’s available. Apart from a strict instruction to go to lots of exhibitions, what else would I tell my youthful self, I wonder? Maybe to lay off the carbs and ignore all the rubbish about low-fat dieting? 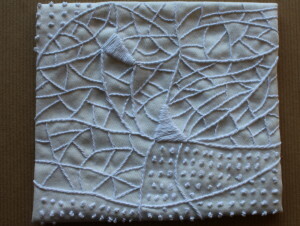 Or to do a bit more stitching? Yes, I think, both of those instructions, if followed through, would have made life easier and more pleasant…..
I’m going to spend part of the afternoon doing a bit more whitework. Progress is glacial, but if there’s anything to show for it, I’ll report back in a few days.